I love August. I love how the light turns golden and plump, like the word August itself. I love the hot colors of the flowers in the garden and of the vegetables I buy at the farmers' market, too. August is quiet. Butterflies in the day and fireflies at night float in the quiet air. On August Sundays, we eat a special breakfast made by my husband---fresh eggs, preserves, and fruit from the farmers. The dog naps. The cat naps. I'm working on paintings behind the scenes, acrylic paintings on my water theme. I leave for Iceland in a few days. I'll see you before I go. Sweet August dreams to you. I love summer too, but my August is freezing cold with the flu to match. 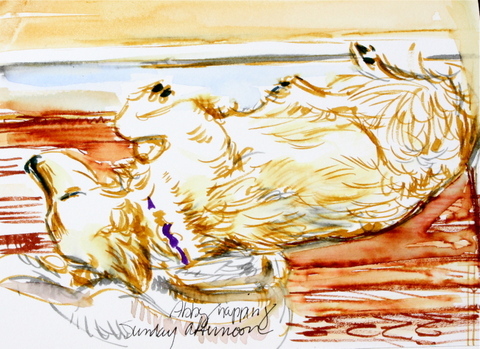 I am longing and longing for summer, and love to see the beautiful summer colours in your paintings. My Arabella sleeps with her paw over here eyes like that too. perfect sketches from a perfect day! Thank you so much, kind commenters! Wish you could all come to Iceland with me! Kslaughter, I did not use waterbrush pens for the top painting. Problemchildbride,thank you especially for your comment about my text here. Coming from you, that's a compliment to be treasured. 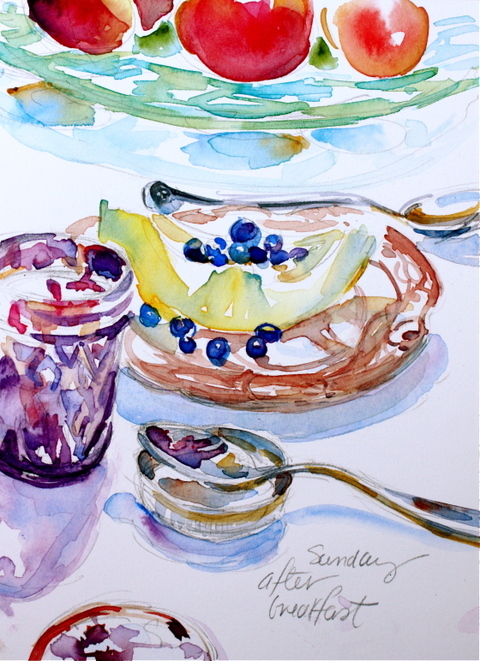 Beautiful drawings and colors: I especially love the colors in the jam jar! I have wanted to go to Iceland since reading Niall's Saga in HS! 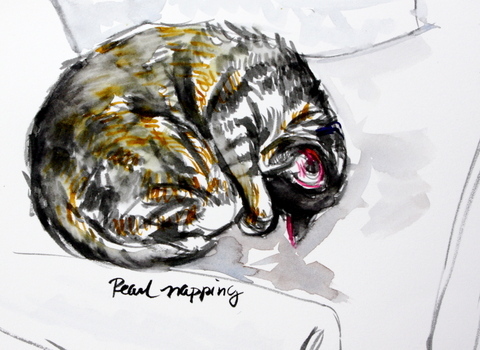 I look forward to seeing your painting and sketches from your trip! What a treat it'll be! "I love how the light turns golden and plump, like the word August itself." What a gorgeous thing to say. Beautiful words and lovely, lovely images, Laura. A real delight. Lovely as always. Have a wonderful trip! Iceland's one of those places I'd like to visit, too.